Nothing comforts us more than a good house to live in and a peaceful environment in the office to work. When you have a good setting, you easily get comfy and gel in with the environment. When there is chaos, you cannot work, when there is a lot of hassle you cannot produce. So it is very important to get the knack of a good possible and healthy environment to spread your wings. Not everybody is kind on the workplace. Sometimes it is only you who has to lead a good gesture in the herd. And that is all what counts. We get the house/ office walls painted, we bring nicer looking furniture, we put expensive stuff so to make the place look cooler than one can imagine. All though this is all transitory and will wipe off with time, but the peace vibes that is extracted is what we all work hard for. Making a fancy living is tough, not everybody can do that. However the idea of decoration goes hand in glove with the mind. Wall decals are pretty popular and they are much sold in the markets as well, you can get them on cheaper prices, they bring value to the walls, they change the entire feel of the room, they look worth financed, they create a new feel, vigor and vibrancy in the place as well. The list of choosing the right wall decal is longer because you have a longer variety to pick the option, it can either be of nature and landscapes, it can also be of animals, plants, cartoon characters lamps/lights, leafs etc. It is entirely up to you how you want the room to look like. 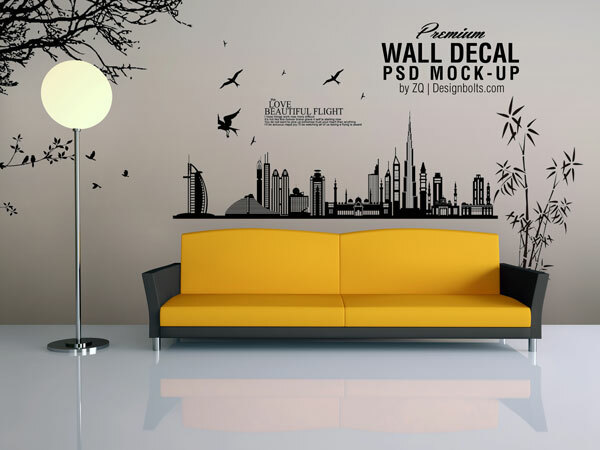 Now here I am presenting before you free Vinyl wall art decal / wall sticker mockup. You can use it to display the wall decals to your clients. Stay hooked to us and we will keep presenting some amazing collection of design posts to benefit you and to entertain your aesthetics. We are currently working on a lot of designers’ projects; but for them, you need to wait. Do write your feedback to us, or contact for queries. Don’t forget to subscribe us guys!